Passengers are welcome to board our ship at 6:00 p.m. After comfortably settling into your cabins, we'll introduce our crew at a welcome cocktail before dinner. Enjoy a "Christmas traditions”-themed evening. Join us for a guided tour of Avignon and the Papal Palace. We'll then head to the Halles market(1) to discover the regional holiday treats. After our tour, we'll return to the ship and cruise towards Tarascon. Enjoy a Christmas-themed evening on board. We'll set out to visit a candle factory(1) and discover the unique scents and colors of this traditional craftsmanship. We'll then cruise to Arles. Upon arrival, we'll head to the rooms of Saint Trophime's cloisters for a visit of the santon exhibition and tradeshow, displaying almost 300 years of this local tradition—from the very first models to the latest creations. We'll next head to Le Paradou to visit a museum displaying more than 400 different santons (hand-painted nativity figurines traditional to the Provence region). La Petite Provence du Paradou is reputed to be one of the largest nativities in the world. We'll then return to Arles. Enjoy a "Christmas Carols”-themed evening on board. 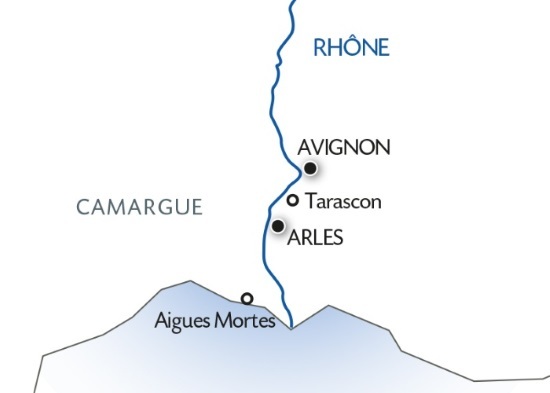 We'll spend the morning cruising to Aigues-Mortes. This afternoon, join us for a visit of the city by coach. We'll finish our tour with a tasting of the traditional sweet fougasse: a delicious light, flat brioche with a subtle orange blossom flavor. Enjoy some free time to explore the town before heading back to the ship. Tonight is our festive gala evening and dinner. Enjoy one last buffet breakfast on board before disembarking at 9:00 a.m. Coach transfer to Avignon. End of our services. Experience Christmas in Provence on a cruise. From Avignon to Aigues-Mortes, be enchanted by the magic of the provincial Christmas markets. Warm up your heart as you visit a traditional candle factory and revel in the Christmas spirit! (1) The Halles in Avignon: closed on Mondays and afternoons. The candle factory: closed on Saturdays and Sundays.